Jenny Conlee performs “The Crane Wife” with The Decemberists at Travelers’ Rest. There’s something transformative about hearing a band perform an entire album live. It’s a slightly different interpretation than what’s heard on a turntable, in the car or through a phone. Some songs become livelier, longer and more emotive while others take on a new identity for fans. That’s what hit me Sunday night at Travelers’ Rest. I started photographing The Decemberists when the opening chords of “The Crane Wife 3” rang out from the stage in front of me. While I tried to concentrate on my shots, I heard the crowd roar with contagious excitement and turned around the see a long line of fans jumping up and down at the barricade at Big Sky Brewing Company in Missoula, Mont. In that moment, I connected with their energy and enthusiasm. A special musical treat for those of us who love The Decemberists and cherish the opportunity to hear an entire album front to back LIVE. In “The Crane Wife,” the album’s storyline focuses on an old Japanese folktale of a poor man who finds an injured crane on his doorstep and nurses it back to health. Once the crane is released, a woman appears on the man’s doorstep, and he instantly falls for her. They quickly marry. The woman offers to weave beautiful clothes out of silk to help earn money for the couple. At first, the man agrees to never watch his wife make clothes, but forces her weave more as their income grows and becomes oblivious to her declining health. With a growing income, the man’s greed increases, and one fateful day, he catches a glimpse of her weaving and discovers his wife is an actual crane plucking feathers from her own body and weaving them into the loom. She sees him, flies away and never returns. True fans of The Decemberists welcome Meloy’s self-deprecating humor at any show, even during a rare performance of “The Crane Wife.” His witty commentary makes the show more unique and memorable. While performing “The Crane Wife,” The Decemberists intended for the audience to hear the original recorded version instead of the 2017 reissue or an earlier “iTunes version with bonus tracks” as Meloy called it. For me, the pinnacle moment included hearing the 12-minute prog-inspired track, “The Island: Come and See/The Landlord’s Daughter/You’ll Not Feel the Drowning,” live during the set while I took photos. I first heard that song live in 2015 during the band’s “What a Terrible World, What a Beautiful World” show at Royal Oak Music Theatre in Royal Oak, Mich., and became instantly hooked. 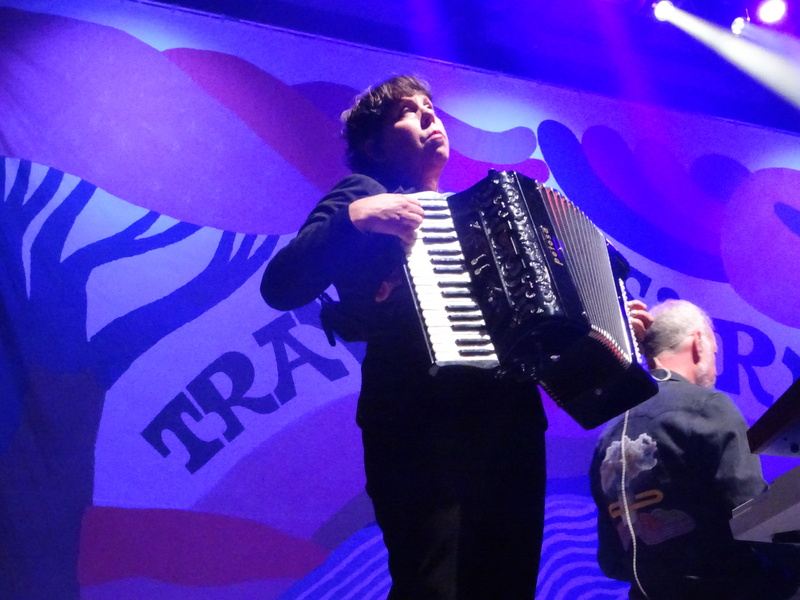 The Decemberists were meant for the stage at Travelers’ Rest, and hopefully, they plan to return next year. 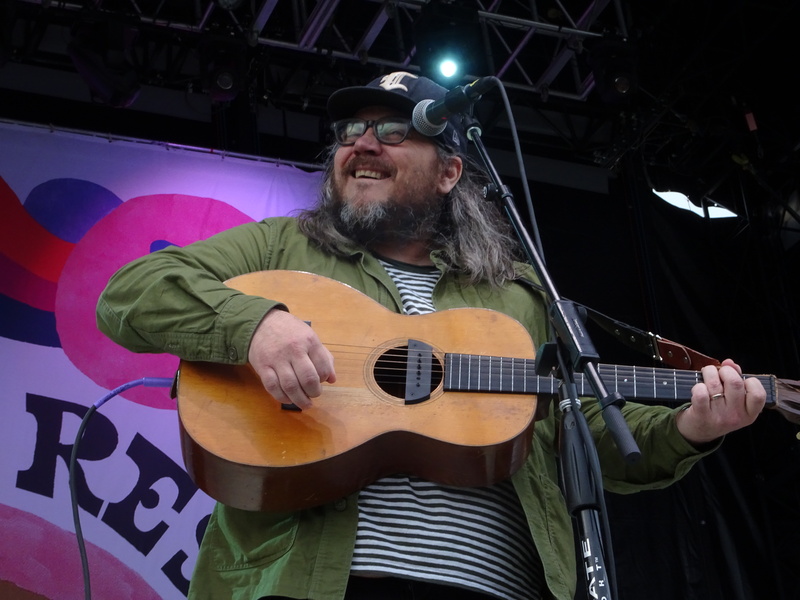 Right before The Decemberists took the stage for “The Crane Wife,” Wilco singer and guitarist Jeff Tweedy played a one-hour, solo acoustic set for Travelers’ Rest attendees. Like Meloy, Tweedy’s self-deprecating humor is just as enlightening and entertaining. He never fails to disappoint crowds at festivals or intimate venues. 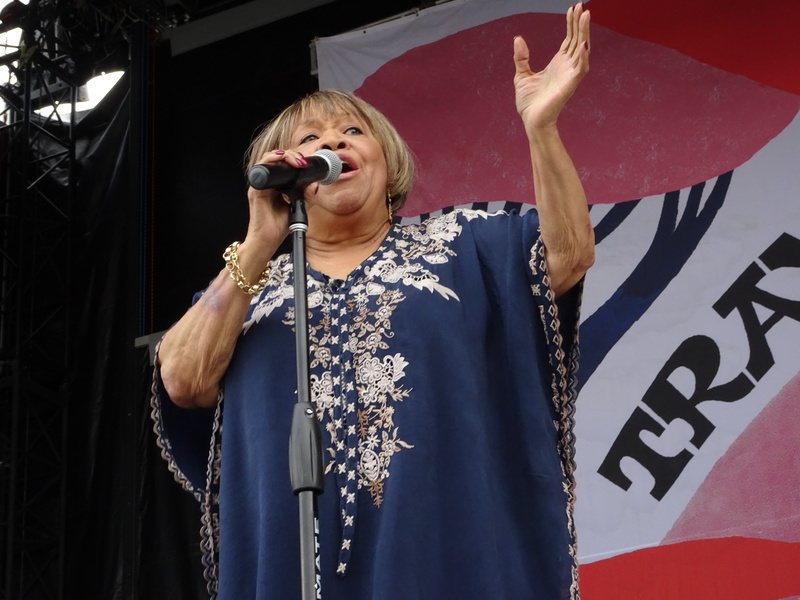 The Chicago-based R&B and gospel icon and civil rights activist opened her 45-minute Travelers’ Rest set with the 1973 politically-charged hit, “If You’re Ready, (Come Go with Me),” from The Staple Singers. Coincidentally, 45 years later, that song still rings true in response to the nation’s current tumultuous political state. It also served as an important reminder to the crowd about maintaining a strong and compassionate human connection when times get tough. Staples also gave a soulful rendition of “Freedom Highway,” the title track from the 1965 album by The Staple Singers and a track penned by Pops Staples, patriarch and bandleader. The lyrics of “Freedom Highway” refer to the murder of Emmett Till at the Tallahatchie River in Mississippi in 1955 and celebrate the famous Selma to Montgomery, Alabama, civil rights marches in 1965. Thankfully, Staples is still here to remind us of that pivotal moment in civil rights history. Her family’s “Freedom Highway” anthem continues to resonate today. Gaelynn Lea: The classically trained violinist, songwriter and folk singer awed audiences with her 30-minute set, which included songs from her 2015 and 2016 releases, “All the Roads that Lead Us Home” and “Deepest Darkness, Brightest Dawn,” respectively. The Decemberists’ Chris Funk, Nate Query and Jenny Conlee accompanied Lea on several songs throughout her set. Hailing from Duluth, Minn., Lea entered the national spotlight when she won NPR’s “Tiny Desk Contest” in 2016. Today, she uses her music to educate fans and the public about Brittle Bone Disease. Tinariwen: A Saharan blues band from northern Mali, Tinariwen performed hypnotic and electrifying guitar rock from their Grammy-winning international album, “Elwan.” The band’s members are descended from a nomadic group of people called Tuareg, who have wandered the dunes of North West Africa for thousands of years. The band comes together in different combinations to play shows and record. Their beautiful world music instantly transported the crowd to another time and place. Cardioid: Comprised of former Radiation City singer Lizzy Ellison and Unknown Mortal Orchestra drummer Riley Geare, the indie rock duo performed tracks from the 2017 debut, “Parts Dept.” The album initially fell under the radar to fans outside Portland, Ore., and Los Angeles, but received a warm revival during Travelers’ Rest. Hopefully, festival goers will hear more from this duo soon. Ural Thomas & The Pain: This legendary R&B powerhouse thrilled festival goers with his groovy soul music and tight dance moves on stage. Back in the 1960s, Ural Thomas played with Otis Redding and the Rolling Stones and was on the rise before walking away from the music business. It’s so wonderful to have this Portland, Ore., singer back in the folder after a long absence. Thomas was one of my favorite performers during of Travelers’ Rest. Whitney: Former Smith Westerns members Max Kakacek and Julien Ehrlich formed Whitney in 2015 and developed a ‘70s-inspired folk rock, AM radio sound. Their breezy music was a perfect fit for a summer festival, especially Travelers’ Rest. I’ve been a fan of Whitney since they released their debut album, “Light Upon The Lake,” in 2016. Last year, they released a stripped-down collection of their demos and outtakes. A must-see for any mellow indie rock lover. Parquet Courts: This post-punk revival, garage rock band knows how to stir things up on stage and get fans moshing. Parquet Courts plowed through their entire 45-minute set with fierce guitar rhythms and passionate vocals. The crowd went nuts when the New York City-based band whipped out “Wide Awake,” the title track from their latest release. 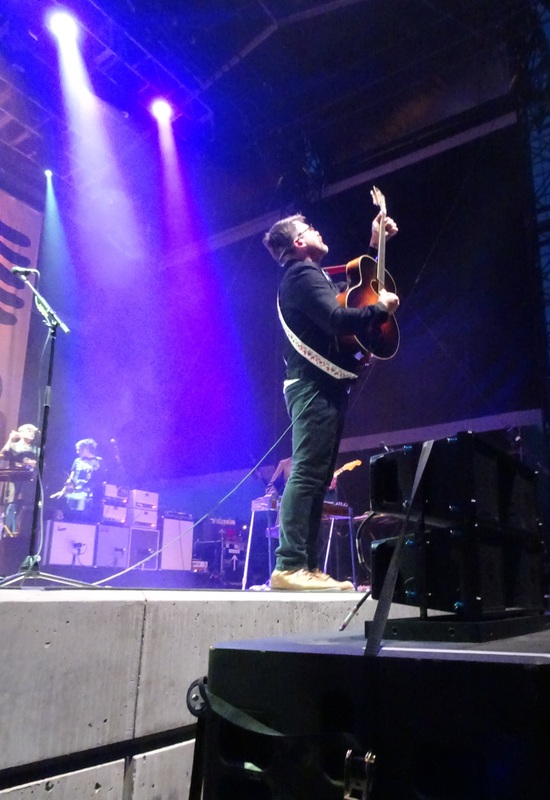 Hopefully, The Decemberists will get ready for a third rendition of Travelers’ Rest in 2019 and bring a whole new set of talented artists with them. One of my favorite albums by The Decemberists!